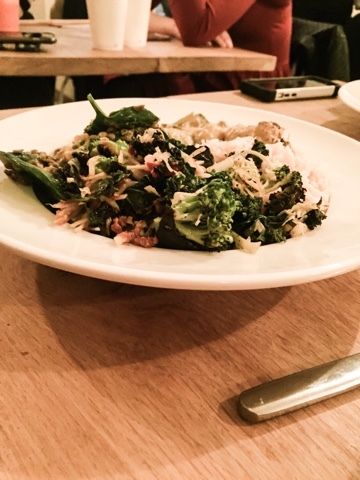 The weekend is here and all this London Mumma wanted to do is eat......but eat well. 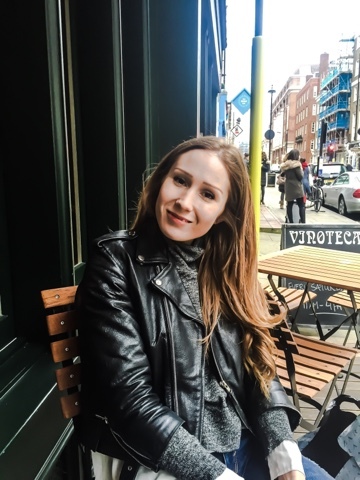 Leanora & I had a lovely lunch date with this beaut, her name is Zoe and she is one of my bestest friends (I sound so 15, with matching friendship bands and we braid each others hair hahaha). How can I describe her, she is a wizard chef, literally her food is to die for! I am so hoping she creates a food blog, just so that she can share her culinary expertise with you all (my little cousins call her the brownie lady lol). Plus my 'Zoebear' is an awesome designer, check out some of her creations here Arevalo King. 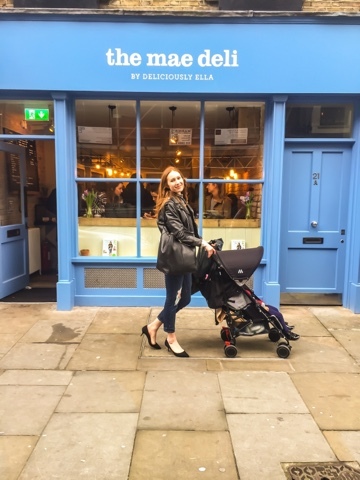 We decided to meet up for a little girly catch-up and try out The Mae Deli. Once we arrived and it was chocka-block! So we popped our names down, was informed by the lovely host that it was a 30-45 min wait which was fine, we had not come so far not to try out Deliciously Ella's treats. 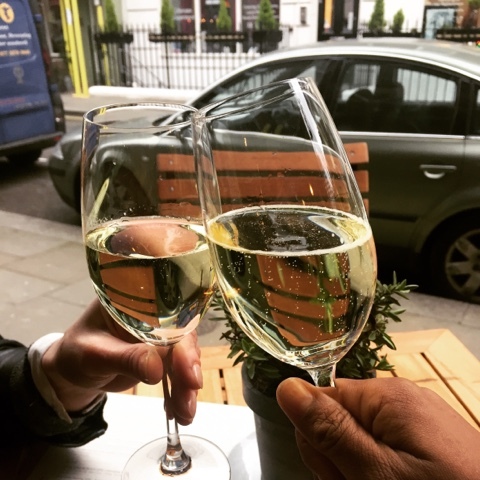 Whilst waiting Zoe, Leanora who was fast asleep and I decided to pop into next door, Vintoeca for a quick drink out side in the breezy London weather, not good for ones hair! No girl wants to look unattractive with the wrong wind blowing on us, I mean the only woman who can get away with looking windswept and gorgeous is Beyonce and I ain't not Beyonce lol! Have you guys seen her new video Formation, how fierce does she look!! The lovely host called us 40 mins later, Leanora had woken up, not in the greatest mood may I add, hence her expression. Those of you, that have children how do you find it when you dine out with your little ones? My little Cha-Chi helped me pick out some lunch, I went for the a plate of 4. 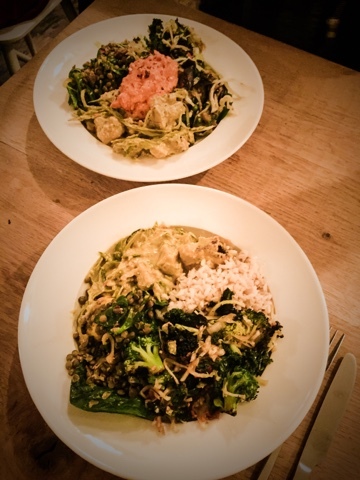 We had the yummiest Thai green curry with brown rice, broccoli & kale salad, which I was not overly keen on, the downside about this for me was, that I did not realise the broccoli was chargrilled (tasted really burnt) and spiced lentils with cauliflower, all was scrummy minus the one side. 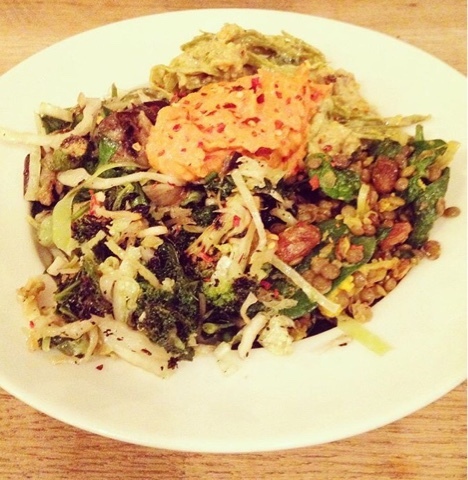 Zoe had a similiar dish but she had with hers the fennel & aubergine salad, with a red pepper and tahini dip. 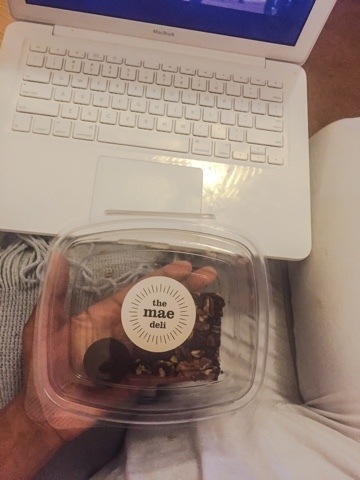 I left feeling great and energised so you certainly get what you pay for and for a hefty dish, costing just over 10pounds (can you tell I have not located the pound sign on my laptop lol, took me 5 mins to decide on how to put it lol!) I certainly can not complain. Will I return, yes but more so that I can try out the juices, but I did bag these bad boys before we left. I must dash as I seem to be held in a disagreement with Leanora, as to who owns and eats the one power ball (not so smart move on my behalf, plus) and raw pecan brownie. I bet she wins...the little minx! Ohhh Ella! 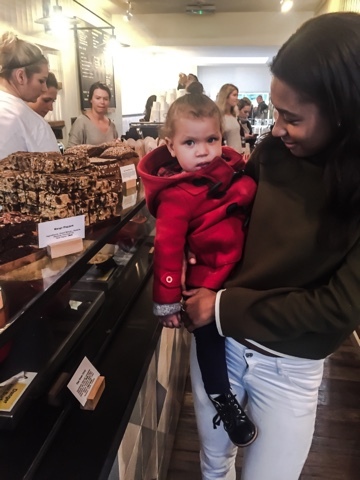 If this London Mumma wants to eat these delightful treats and reluctantly finding myself sharing with Leanora, then I am 100% buying your book to make for the masses, when I say masses thats Leanora & I lol!